This stylistic diagram shows a gene in relation to the double helix structure of DNA and to a chromosome (right). The chromosome is X-shaped because it is dividing. 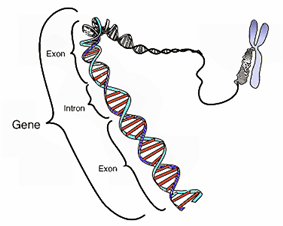 Introns are regions often found in eukaryote genes that are removed in the splicing process (after the DNA is transcribed into RNA): Only the exons encode the protein. The diagram labels a region of only 55 or so bases as a gene. In reality, most genes are hundreds of times longer. A gene is the molecular unit of eye color or number of limbs, and some of which are not, such as blood type, increased risk for specific diseases, or the thousands of basic biochemical processes that comprise life. The word gene is derived from the Greek word genesis meaning "birth", or genos meaning "origin" (see pangenesis). The chemical structure of a four-base fragment of a DNA double helix. A modern working definition of a gene is "a locatable region of genomic sequence, corresponding to a unit of inheritance, which is associated with regulatory regions, transcribed regions, and or other functional sequence regions ". Colloquial usage of the term gene (e.g., "good genes", "hair color gene") may actually refer to an allele: a gene is the basic instruction— a sequence of nucleic acids (DNA or, in the case of certain viruses RNA), while an allele is one variant of that gene. Thus, when the mainstream press refers to "having" a "gene" for a specific trait, this is customarily inaccurate. In most cases, all people would have a gene for the trait in question, although certain people will have a specific allele of that gene, which results in the trait variant. Further, genes code for proteins, which might result in identifiable traits, but it is the gene (genotype), not the trait (phenotype), which is inherited. Big genes are a class of genes whose nuclear transcript spans 500 kb (1 kb = 1,000 base pairs) or more of chromosomal DNA. The largest of the big genes is the gene for dystrophin, which spans 2.3 Mb. Many big genes have modestly sized mRNAs; the exons encoding these RNAs typically encompass about 1% of the total chromosomal gene region in which they occur. The existence of genes was first implied from the work of phenotype (the visible traits of that organism) and the conversion of one form into another within few generations. Charles Darwin used the term gemmule to describe a microscopic unit of inheritance, and what would later become known as chromosomes had been observed separating out during cell division by Wilhelm Hofmeister as early as 1848. The idea that chromosomes are the carriers of inheritance was expressed in 1883 by Wilhelm Roux. Darwin also coined the word pangenesis by (1868). The word pangenesis is made from the Greek words pan (a prefix meaning "whole", "encompassing") and genesis ("birth") or genos ("origin"). 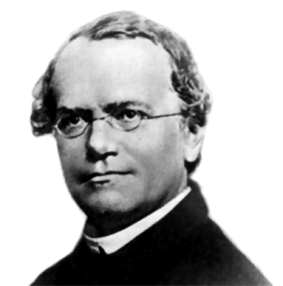 Mendel's concept was given a name by Drosophila. In 1928, Frederick Griffith showed that genes could be transferred. In what is now known as Griffith's experiment, injections into a mouse of a deadly strain of bacteria that had been heat-killed transferred genetic information to a safe strain of the same bacteria, killing the mouse. A series of subsequent discoveries led to the realization decades later that Edward Lawrie Tatum showed that mutations in genes caused errors in specific steps in metabolic pathways. This showed that specific genes code for specific proteins, leading to the "one gene, one enzyme" hypothesis. Oswald Avery, Colin Munro MacLeod, and Maclyn McCarty showed in 1944 that DNA holds the gene's information. In 1953, James D. Watson and Francis Crick demonstrated the molecular structure of DNA. Together, these discoveries established the central dogma of molecular biology, which states that proteins are translated from RNA which is transcribed from DNA. This dogma has since been shown to have exceptions, such as reverse transcription in retroviruses. In 1972, Walter Fiers and his team at the Laboratory of Molecular Biology of the University of Ghent (Ghent, Belgium) were the first to determine the sequence of a gene: the gene for Bacteriophage MS2 coat protein. Richard J. Roberts and Phillip Sharp discovered in 1977 that genes can be split into segments. This led to the idea that one gene can make several proteins. Recently (as of 2003–2006), biological results let the notion of gene appear more slippery. In particular, genes do not seem to sit side by side on DNA like discrete beads. Instead, regions of the DNA producing distinct proteins may overlap, so that the idea emerges that "genes are one long continuum". It was first hypothesized in 1986 by Walter Gilbert that neither DNA nor protein would be required in such a primitive system as that of a very early stage of the earth if RNA could perform as simply a catalyst and genetic information storage processor. The modern study of genetics at the level of DNA is known as molecular genetics and the synthesis of molecular genetics with traditional Darwinian evolution is known as the modern evolutionary synthesis. According to the theory of dominant or recessive; dominant alleles give rise to their corresponding phenotypes when paired with any other allele for the same trait, whereas recessive alleles give rise to their corresponding phenotype only when paired with another copy of the same allele. For example, if the allele specifying tall stems in pea plants is dominant over the allele specifying short stems, then pea plants that inherit one tall allele from one parent and one short allele from the other parent will also have tall stems. Mendel's work demonstrated that alleles assort independently in the production of gametes, or germ cells, ensuring variation in the next generation. When proteins are manufactured, the gene is first copied into RNA as an intermediate product. In other cases, the RNA molecules are the actual functional products. For example, RNAs known as ribozymes are capable of enzymatic function, and microRNA has a regulatory role. The DNA sequences from which such RNAs are transcribed are known as RNA genes. Some viruses store their entire genomes in the form of RNA, and contain no DNA at all. Because they use RNA to store genes, their cellular hosts may synthesize their proteins as soon as they are infected and without the delay in waiting for transcription. On the other hand, RNA retroviruses, such as HIV, require the reverse transcription of their genome from RNA into DNA before their proteins can be synthesized. In 2006, French researchers came across a puzzling example of RNA-mediated inheritance in mice. Mice with a loss-of-function mutation in the gene Kit have white tails. Offspring of these mutants can have white tails despite having only normal Kit genes. The research team traced this effect back to mutated Kit RNA. While RNA is common as genetic storage material in viruses, in mammals in particular RNA inheritance has been observed very rarely. Diagram of the "typical" eukaryotic protein-coding gene. Promoters and enhancers determine what portions of the DNA will be transcribed into the precursor mRNA (pre-mRNA). The pre-mRNA is then spliced into messenger RNA (mRNA) which is later translated into protein. The vast majority of living organisms encode their genes in long strands of DNA (deoxyribonucleic acid). DNA consists of a chain made from four types of nucleotide subunits, each composed of: a five-carbon sugar (2'-deoxyribose), a phosphate group, and one of the four bases adenine, cytosine, guanine, and thymine. The most common form of DNA in a cell is in a double helix structure, in which two individual DNA strands twist around each other in a right-handed spiral. In this structure, the base pairing rules specify that guanine pairs with cytosine and adenine pairs with thymine. The base pairing between guanine and cytosine forms three hydrogen bonds, whereas the base pairing between adenine and thymine forms two hydrogen bonds. The two strands in a double helix must therefore be complementary, that is, their bases must align such that the adenines of one strand are paired with the thymines of the other strand, and so on. Due to the chemical composition of the pentose residues of the bases, DNA strands have directionality. One end of a DNA polymer contains an exposed hydroxyl group on the deoxyribose; this is known as the 3' end of the molecule. The other end contains an exposed phosphate group; this is the 5' end. The directionality of DNA is vitally important to many cellular processes, since double helices are necessarily directional (a strand running 5'-3' pairs with a complementary strand running 3'-5'), and processes such as DNA replication occur in only one direction. All nucleic acid synthesis in a cell occurs in the 5'-3' direction, because new monomers are added via a dehydration reaction that uses the exposed 3' hydroxyl as a nucleophile. The expression of genes encoded in DNA begins by transcribing the gene into RNA, a second type of nucleic acid that is very similar to DNA, but whose monomers contain the sugar ribose rather than deoxyribose. RNA also contains the base uracil in place of thymine. RNA molecules are less stable than DNA and are typically single-stranded. Genes that encode proteins are composed of a series of three-nucleotide sequences called codons, which serve as the words in the genetic language. The genetic code specifies the correspondence during protein translation between codons and amino acids. The genetic code is nearly the same for all known organisms. All genes have regulatory regions in addition to regions that explicitly code for a protein or RNA product. A regulatory region shared by almost all genes is known as the promoter, which provides a position that is recognized by the transcription machinery when a gene is about to be transcribed and expressed. A gene can have more than one promoter, resulting in RNAs that differ in how far they extend in the 5' end. Although promoter regions have a consensus sequence that is the most common sequence at this position, some genes have "strong" promoters that bind the transcription machinery well, and others have "weak" promoters that bind poorly. These weak promoters usually permit a lower rate of transcription than the strong promoters, because the transcription machinery binds to them and initiates transcription less frequently. Other possible regulatory regions include enhancers, which can compensate for a weak promoter. Most regulatory regions are "upstream"—that is, before or toward the 5' end of the transcription initiation site. Eukaryotic promoter regions are much more complex and difficult to identify than prokaryotic promoters. Many prokaryotic genes are organized into operons, or groups of genes whose products have related functions and which are transcribed as a unit. By contrast, eukaryotic genes are transcribed only one at a time, but may include long stretches of DNA called introns which are transcribed but never translated into protein (they are spliced out before translation). Splicing can also occur in prokaryotic genes, but is less common than in eukaryotes. Google Book Search; first published 1976. Guerzoni, McLysaght, D, A (November 10, 2011). De Novo Origins of Human Genes.. PLoS Genet 7(11). Hartwell L, Hood L, Goldberg ML, Reynolds AE, Silver LM, Veres R (2004). Genetics: from genes to genomes (Second ed.). Boston: McGraw-Hill Higher Education. ^ a b Pearson H (2006). "Genetics: what is a gene?". Nature 441 (7092): 398–401. ^ a b c Elizabeth Pennisi (2007). "DNA Study Forces Rethink of What It Means to Be a Gene". Science 316 (5831): 1556–1557. ^ Noble, D. (Sep 2008). "Genes and causation" (Free full text). Philosophical transactions. Series A, Mathematical, physical, and engineering sciences 366 (1878): 3001–3015. ^ Darwin C. (1868). Animals and Plants under Domestication (1868). ^ "The Human Genome Project Timeline". Retrieved 2006-09-13. ^ a b c d e Gerstein Mark B. et al. ; Bruce, C.; Rozowsky, J. S.; Zheng, D.; Du, J.; Korbel, J. O.; Emanuelsson, O.; Zhang, Z. D. et al. (2007). "What is a gene, post-ENCODE? History and updated definition". Genome Research 17 (6): 669–681. ^ Steinman RM, Moberg CL (February 1994). "A triple tribute to the experiment that transformed biology". J. Exp. Med. 179 (2): 379–84. ^ Min Jou W, Haegeman G, Ysebaert M, Fiers W (1972). "Nucleotide sequence of the gene coding for the bacteriophage MS2 coat protein". Nature 237 (5350): 82–8. ^ Rassoulzadegan M, Grandjean V, Gounon P, Vincent S, Gillot I, Cuzin F; Grandjean; Gounon; Vincent; Gillot; Cuzin (2006). "RNA-mediated non-mendelian inheritance of an epigenetic change in the mouse". Nature 441 (7092): 469–74. ^ Mortazavi A, Williams BA, McCue K, Schaeffer L, Wold B (May 2008). "Mapping and quantifying mammalian transcriptomes by RNA-Seq". Nat. Methods 5 (7): 621–8. ^ Woodson SA (1998). "Ironing out the kinks: splicing and translation in bacteria". Genes Dev. 12 (9): 1243–7. ^ Braig M, Schmitt C (2006). "Oncogene-induced senescence: putting the brakes on tumor development". Cancer Res 66 (6): 2881–4. ^ International Human Genome Sequencing Consortium (2004). "Finishing the euchromatic sequence of the human genome". Nature 431 (7011): 931–45. ^ MeSH (2008) National Library of Medicine — Medical Subject Headings. National library of medicine http://www.nlm.nih.gov/cgi/mesh/2008/MB_cgi?mode=&term=RNA+Viruses&field=entry (accessed 27 September 2011) B04.820. 19990101. ^ a b Watson JD, Baker TA, Bell SP, Gann A, Levine M, Losick R (2004). Molecular Biology of the Gene (5th ed.). Peason Benjamin Cummings (Cold Spring Harbor Laboratory Press). ^ Schuler GD, Boguski MS, Stewart EA, et al (October 1996). "A gene map of the human genome". Science 274 (5287): 540–6. ^ Yu J, Hu S, Wang J, et al. (April 2002). "A draft sequence of the rice genome (Oryza sativa L. ssp. indica)". Science 296 (5565): 79–92. ^ a b Carninci P, Hayashizaki Y (April 2007). "Noncoding RNA transcription beyond annotated genes". Curr. Opin. Genet. Dev. 17 (2): 139–44. ^ a b Claverie JM (September 2005). "Fewer genes, more noncoding RNA". Science 309 (5740): 1529–30. ^ Carolina Perez-Iratxeta, et al; Palidwor, Gareth; Andrade-Navarro, Miguel A (2007). "Towards completion of the Earth's proteome". Nature EMBO reports 8 (12): 1135–1141. ^ Thomas, KR; Capecchi, MR. (1987). "Site-directed mutagenesis by gene targeting in mouse embryo-derived stem cells". Cell 51 (3): 503–12. ^ a b Deng, C. (2007). "In Celebration of Dr. Mario R. Capecchi's Nobel Prize". Int J Biol Sci 3: 417–419. ^ Rassoulzadegan M, Grandjean V, Gounon P, Vincent S, Gillot I, Cuzin F; Grandjean; Gounon; Vincent; Gillot; Cuzin (May 2006). "RNA-mediated non-mendelian inheritance of an epigenetic change in the mouse". Nature 441 (7092): 469–74. ^ Spilianakis CG, Lalioti MD, Town T, Lee GR, Flavell RA; Lalioti; Town; Lee; Flavell (June 2005). "Interchromosomal associations between alternatively expressed loci". Nature 435 (7042): 637–45. ^ Marande, William; Burger, Gertraud (19 October 2007). "Mitochondrial DNA as a genomic jigsaw puzzle". Science (AAAS) 318 (5849): 415. ^ Parra G, Reymond A, Dabbouseh N, et al. (January 2006). "Tandem chimerism as a means to increase protein complexity in the human genome". Genome Res. 16 (1): 37–44. ^ Kapranov P, Drenkow J, Cheng J, et al. (July 2005). "Examples of the complex architecture of the human transcriptome revealed by RACE and high-density tiling arrays". Genome Res. 15 (7): 987–97. The concept that genes are clearly delimited is also being eroded. There is evidence for fused proteins stemming from two adjacent genes that can produce two separate protein products. While it is not clear whether these fusion proteins are functional, the phenomenon is more frequent than previously thought. Even more ground-breaking than the discovery of fused genes is the observation that some proteins can be composed of exons from far away regions and even different chromosomes. This new data has led to an updated, and probably tentative, definition of a gene as "a union of genomic sequences encoding a coherent set of potentially overlapping functional products". This new definition categorizes genes by functional products, whether they be proteins or RNA, rather than specific DNA loci; all regulatory elements of DNA are therefore classified as gene-associated regions. The definition of a gene is still changing. The first cases of RNA-based inheritance have been discovered in mammals. Evidence is also accumulating that the control regions of a gene do not necessarily have to be close to the coding sequence on the linear molecule or even on the same chromosome. Spilianakis and colleagues discovered that the promoter region of the interferon-gamma gene on chromosome 10 and the regulatory regions of the T(H)2 cytokine locus on chromosome 11 come into close proximity in the nucleus possibly to be jointly regulated. Even the coding sequence of a gene itself doesn't have to be all on the same chromosome: Marande and Burger showed that, in the mitochondria of the protist Diplonema papillatum, "genes are systematically fragmented into small pieces that are encoded on separate chromosomes, transcribed individually, and then concatenated into contiguous messenger RNA molecules". The concept of the gene has changed considerably (see RNA or protein products. It was also previously believed that one gene makes one protein; this concept was overthrown by the discovery of alternative splicing and trans-splicing. Gene targeting strategies have been expanded to all kinds of modifications, including point mutations, isoform deletions, mutant allele correction, large pieces of chromosomal DNA insertion and deletion, tissue specific disruption combined with spatial and temporal regulation and so on. It is predicted that the ability to generate mouse models with predictable phenotypes will have a major impact on studies of all phases of development, immunology, neurobiology, oncology, physiology, metabolism, and human diseases. Gene targeting is also in theory applicable to species from which totipotent embryonic stem cells can be established, and therefore may offer a potential to the improvement of domestic animals and plants. survival machines. A river of genes may fork into two branches representing two non-interbreeding species as a result of geographical separation. The difference is: the molecular gene transcribes as a unit, and the evolutionary gene inherits as a unit. gene-centric view of evolution in his 1966 book Adaptation and Natural Selection. He proposed an evolutionary concept of gene to be used when we are talking about natural selection favoring some genes. The definition is: "that which segregates and recombines with appreciable frequency." According to this definition, even an asexual genome could be considered a gene, insofar that it have an appreciable permanency through many generations. Essential genes are those genes of an organism that are thought to be critical for its survival. Surprisingly few genes have been shown to be absolutely essential for the survival of bacteria, e.g. only about 10% of the ~4,200 genes of Escherichia coli. HUGO Gene Nomenclature Committee (HGNC) for each known human gene in the form of an approved gene name and symbol (short-form abbreviation). All approved symbols are stored in the HGNC Database. Each symbol is unique and each gene is only given one approved gene symbol. This also facilitates electronic data retrieval from publications. In preference each symbol maintains parallel construction in different members of a gene family and can be used in other species, especially the mouse. The protein-encoding component of the human genome, categorized by function of each gene product, given both as number of genes and as percentage of all genes. The total complement of genes in an organism or cell is known as its haploid; those with two copies are called diploid; and those with more than two copies are called polyploid. The copies of genes on the chromosomes are not necessarily identical. In sexually reproducing organisms, one copy is normally inherited from each parent. Mutations propagated to the next generation lead to variations within a species' population. Variants of a single gene are known as alleles, and differences in alleles may give rise to differences in traits. Although it is rare for the variants in a single gene to have clearly distinguishable phenotypic effects, certain well-defined traits are in fact controlled by single genetic loci. A gene's most common allele is called the wild type allele, and rare alleles are called mutants. However, this does not imply that the wild-type allele is the ancestor from which the mutants are descended. For the most part, these mutations are recessive and are phased out quickly. However, on occasion these mutations appear as dominant to other alleles, becoming predominant and increasing in the rate they are seen in a population. DNA replication is for the most part extremely accurate, with an error rate per site of around 10−6 to 10−10 in fitness; it is commonly thought that mutations may produce beneficial variants. The most common mutations include point mutations in which a single codon is replaced, frame shift mutation where a single nucleotide base is inserted or deleted from the DNA strand so that all bases are shifted over, silent mutations where a single nucleotide base is replaced but without causing a change for the amino acid being coded for, and nonsense mutations, where a change in a single nucleotide base causes a codon to be turned into a stop codon hence terminating transcription at this point. During the process of meiotic cell division, an event called genetic linkage. The duplication and transmission of genetic material from one generation of cells to the next is the basis for molecular inheritance, and the link between the classical and molecular pictures of genes. Organisms inherit the characteristics of their parents because the cells of the offspring contain copies of the genes in their parents' cells. In meiosis produces cells called gametes or germ cells that are haploid, or contain only one copy of each gene. The gametes produced by females are called eggs or ova, and those produced by males are called sperm. Two gametes fuse to form a fertilized egg, a single cell that once again has a diploid number of genes—each with one copy from the mother and one copy from the father. After DNA replication is complete, the cell must physically separate the two copies of the genome and divide into two distinct membrane-bound cells. In prokaryotes - bacteria and archaea - this usually occurs via a relatively simple process called binary fission, in which each circular genome attaches to the cell membrane and is separated into the daughter cells as the membrane invaginates to split the cytoplasm into two membrane-bound portions. Binary fission is extremely fast compared to the rates of cell division in eukaryotes. Eukaryotic cell division is a more complex process known as the cell cycle; DNA replication occurs during a phase of this cycle known as S phase, whereas the process of segregating chromosomes and splitting the cytoplasm occurs during M phase. In many single-celled eukaryotes such as yeast, reproduction by budding is common, which results in asymmetrical portions of cytoplasm in the two daughter cells. The growth, development, and reproduction of organisms relies on cell division, or the process by which a single cell divides into two usually identical daughter cells. This requires first making a duplicate copy of every gene in the genome in a process called DNA replication. The copies are made by specialized enzymes known as DNA polymerases, which "read" one strand of the double-helical DNA, known as the template strand, and synthesize a new complementary strand. Because the DNA double helix is held together by base pairing, the sequence of one strand completely specifies the sequence of its complement; hence only one strand needs to be read by the enzyme to produce a faithful copy. The process of DNA replication is semiconservative; that is, the copy of the genome inherited by each daughter cell contains one original and one newly synthesized strand of DNA. Translation is the process by which a mature mRNA molecule is used as a template for synthesizing a new protein. Translation is carried out by ribosomes, large complexes of RNA and protein responsible for carrying out the chemical reactions to add new amino acids to a growing polypeptide chain by the formation of peptide bonds. The genetic code is read three nucleotides at a time, in units called codons, via interactions with specialized RNA molecules called transfer RNA (tRNA). Each tRNA has three unpaired bases known as the anticodon that are complementary to the codon it reads; the tRNA is also covalently attached to the amino acid specified by the complementary codon. When the tRNA binds to its complementary codon in an mRNA strand, the ribosome ligates its amino acid cargo to the new polypeptide chain, which is synthesized from amino terminus to carboxyl terminus. During and after its synthesis, the new protein must fold to its active three-dimensional structure before it can carry out its cellular function. In prokaryotes, transcription occurs in the cytoplasm; for very long transcripts, translation may begin at the 5' end of the RNA while the 3' end is still being transcribed. In eukaryotes, transcription necessarily occurs in the nucleus, where the cell's DNA is sequestered; the RNA molecule produced by the polymerase is known as the primary transcript and must undergo post-transcriptional modifications before being exported to the cytoplasm for translation. The splicing of introns present within the transcribed region is a modification unique to eukaryotes; alternative splicing mechanisms can result in mature transcripts from the same gene having different sequences and thus coding for different proteins. This is a major form of regulation in eukaryotic cells. The process of genetic transcription produces a single-stranded RNA molecule known as messenger RNA, whose nucleotide sequence is complementary to the DNA from which it was transcribed. The DNA strand whose sequence matches that of the RNA is known as the coding strand and the strand from which the RNA was synthesized is the template strand. Transcription is performed by an enzyme called an RNA polymerase, which reads the template strand in the 3' to 5' direction and synthesizes the RNA from 5' to 3'. To initiate transcription, the polymerase first recognizes and binds a promoter region of the gene. Thus a major mechanism of gene regulation is the blocking or sequestering of the promoter region, either by tight binding by repressor molecules that physically block the polymerase, or by organizing the DNA so that the promoter region is not accessible. The genetic code is the set of rules by which information encoded within a gene is translated into a functional protein. Each gene consists of a specific sequence of nucleotides encoded in DNA or RNA. The nucleotide being made up of a sugar, a phosphate molecule and a specific base (adenine, thymine, cytosine, guanine or sometimes uracil [thymine is replaced with uracil in some viruses]); a correspondence between nucleotides, the basic building blocks of genetic material, and amino acids, the basic building blocks of proteins, must be established for genes to be successfully translated into functional proteins. 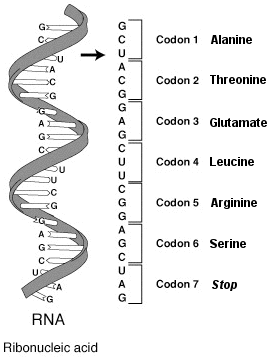 Sets of three nucleotides, known as codons, each correspond to a specific amino acid or to a signal; three codons are known as "stop codons" and, instead of specifying a new amino acid, alert the translation machinery that the end of the gene has been reached, just as a specific set of 3 bases, "AUG", known as the "start codon", signifies the gene to start transcribing. There are 64 possible codons (four possible nucleotides at each of three positions, hence 43 possible codons) and only 20 standard amino acids; hence the code is redundant and multiple codons can specify the same amino acid. The correspondence between codons and amino acids is nearly universal among all known living organisms. Schematic diagram of a single-stranded RNA molecule illustrating the position of three-base codons. In all organisms, there are two major steps separating a protein-coding gene from its protein: First, the DNA on which the gene resides must be transcribed from DNA to messenger RNA (mRNA); and, second, it must be translated from mRNA to protein. RNA-coding genes must still go through the first step, but are not translated into protein. The process of producing a biologically functional molecule of either RNA or protein is called gene expression, and the resulting molecule itself is called a gene product. , about 80% of the bases in the genome may be expressed, so the term "junk DNA" may be a misnomer.human genome However it now appears that, although protein-coding DNA makes up barely 2% of the  Whereas the chromosomes of prokaryotes are relatively gene-dense, those of eukaryotes often contain so-called "